A Labrador Retriever’s intelligence and energy makes it a natural for competitions and the show ring. Showing your Labrador Retriever is also a great way for the two of you to bond. You might even have a champion in the making. Sure, you like to have fun as much as the next person, but maybe, when you look at your Lab you see a true beauty — the closest thing to Lab perfection you can imagine. If that sounds like you, you should consider trying conformation shows. At a conformation dog show, a trained judge analyzes each dog to determine which dog most closely matches the written breed standard. To compete, your dog must be registered with a purebred dog registry like the American Kennel Club (AKC) and the United Kennel Club (UKC). Check with organizations for local events you can check out to see if you’d be interesting in competing. Spayed or neutered dogs may not participate in conformation shows. A basic obedience background is essential for any canine sport, so one of the best places to start is with obedience competition. Obedience competitions can be great fun for you and your Lab and they can also get quite competitive. Try attending an AKC- or UKC-sanctioned obedience competition to see how it works, or attend less-formal obedience events sponsored by your local dog club. Canine Good Citizen test: A 10-part exam that tests a dog ability to demonstrate good manners and proves he can act like a good citizen in public. Obedience trials: Formal obedience trials test the dog’s ability to follow commands amid numerous distractions. Check out the AKC for rules and information on how to get started. The Lab’s eagerness to please helps him to excel at obedience. Rally: In Rally, dogs and their handlers (that’s you) compete on a course of 10 to 20 stations, performing an obedience task at each one. High energy Labrador Retrievers may find Rally more exciting than straight obedience. Check with the AKC for great information about Rally. Tracking tests: Tracking exercises test your Lab’s ability to track a scent. They are strenuous, athletic events for you and your dog. Tracking is a fun, addictive, outdoorsy sport — kind of a competitive form of canine search and rescue. Check out an AKC-sponsored tracking event to learn more. If you’re looking for some serious fun, consider training your Lab to compete in one of the sporting dog events, like agility, flyball, freestyle, or Frisbee. Canine freestyle:If your Labrador Retriever is better at funny tricks and precision commands, the two of you may love to compete in canine freestyle (sometimes called canine musical freestyle) — a competition that combines obedience moves with choreography. Check out the Canine Freestyle Federation. Agility trials: Agility is one of the latest rages in dog events. Why? Because it’s a whole lot of fun! Your Lab gets to perform on a playground of equipment, competing against other dogs to see who can maneuver the courses with the most accuracy and speed. You can find agility events through the AKC’s agility page or your local dog club. If you Lab is a little speed demon, you might prefer competing in Jumpers With Weaves (JWW). JWW is a whole separate agility class that further demonstrates how well you and your dog work together. The course is mostly jumps, and your dog is judged primarily on speed and jumping ability. Flyball: If your Lab wants to get in touch with his inner Retriever, you and he may want to take up flyball—a sort of doggie relay race. Each dog runs to a ball launcher and uses his paw to press the release, then he chases after and catches the ball, and then he runs over hurdles to get back to the starting line. Then the next dog starts. To find out more about flyball and find competitions to watch, check with the North American Flyball Association. Lab’s retrieving ability combined with their athleticism makes them a natural at flyball. You can start training your Lab to learn flyball when he is just a puppy. To start him learning, always run away from the puppy after you throw the ball for him. This will encourage him to chase after you, increasing his speed and his instinct for the relay race. Canine Frisbee (Disc Dog): If you and your Lab like to play Frisbee, you may enjoy getting involved in Canine Frisbee (also called Disc Dog) events. Labs make excellent Frisbee dogs. Attend a Canine Frisbee event to see if you think you and your Lab would enjoy competing. Find a club near you to see the event schedule. If your dog is sick, injured, or suffering from a condition such as hip dysplasia that would make jumping or any other agility activity painful or dangerous, retire your dog from competition, at least temporarily. Labs were bred for the hunt. Their natural retrieving skills were developed to retrieve fish and game. The following dog events are a great way to show off your dog’s abilities. 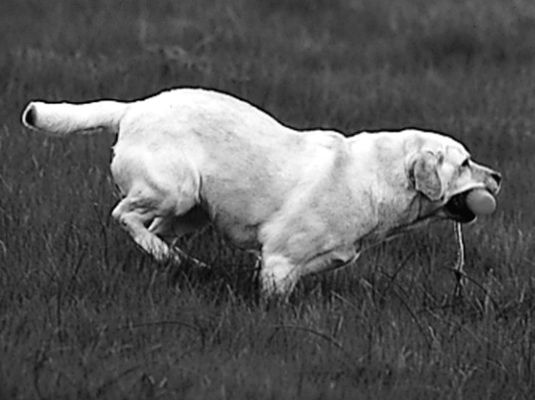 Hunting trials: Hunting trials test how well your Labrador Retriever can work with you on the hunt through simulated hunting conditions. Your dog will need to retrieve game in many various conditions. To find a hunting trial in your area, check out AKC Retriever Hunting Tests for more information. Field trials: Field trials give breeds designed for field work the opportunity to exercise their natural abilities. In a Labrador Retriever field trial (also called non-slip retriever trials), your Lab will retrieve game birds under all kinds of conditions. To find a field trial in your area, check out the AKC field trials information.